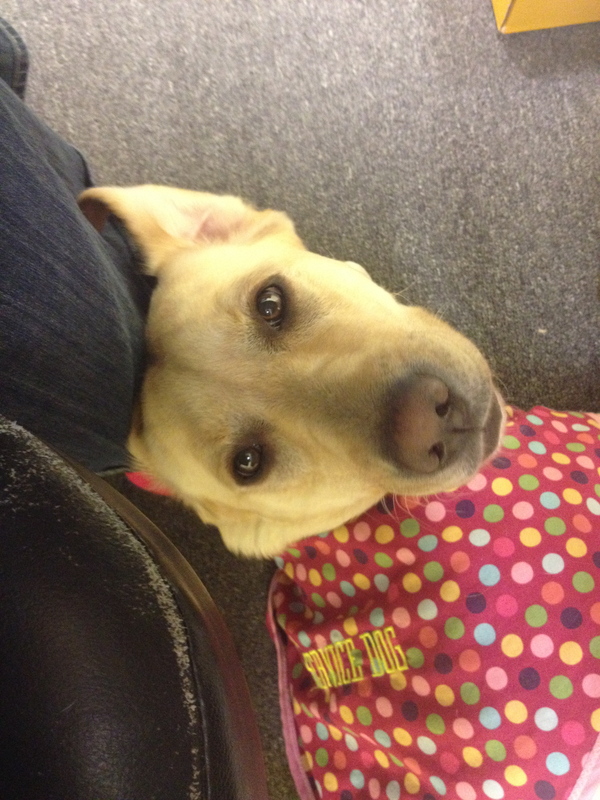 Bella is a Yellow Lab and she is a trained medical alert and psychiatric Service Dog. She turned 3 recently and has been with me for almost 2 years. We were matched October 12th 2013. And man has she changed my life. Talking about Bella is difficult because she has so many sides to her. It is important to note that she is multiple things, she’s a working dog (Service), a playful pooch and my best friend. To prove this point, she is currently dropping a squeaker toy on my keyboard because I should be playing not working because we are at home not at work. But alas this is important so I will type while playing (it’s a multitasking gift).>this section was typed over a year ago and she still does the same thing. Ha! I am going to start with her service dog side. While Service Dogs are typically known around the world, most people don’t understand the various uses and types of service dogs. Bella’s Medical alert title refers to her ability to predict and inform me of different type of body changes, such as rapid heart beat that may lead to more serious issues such as panic attacks, dizzy spells and other issues involved with my medical condition. Recently I discovered that this also includes my headaches. The second part of her title is the most important to me. 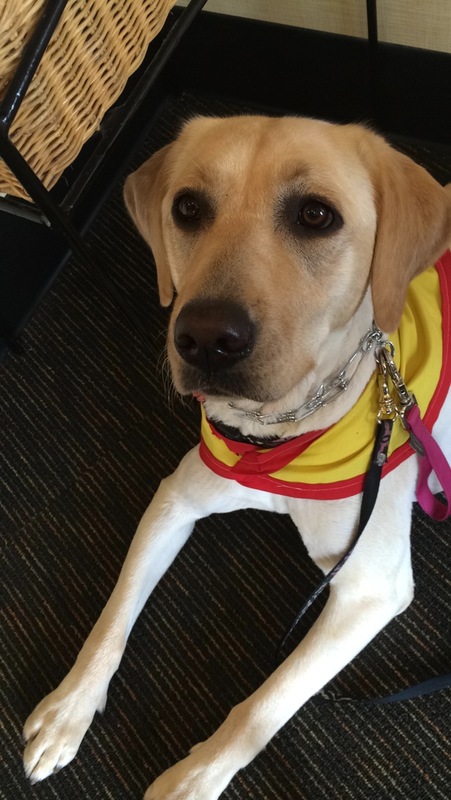 A psychiatric Service Dog is used as an aid to treat a mental illness. Which type of mental Illness I have is irrelevant because in the end almost all mental illnesses are linked together. What Bella is here for is to help me successfully function in day-to-day life with the struggles that plague someone with mental illness. I know that may sound vague but really that’s what she does, and she is awesome at it. Some of the things she does include Grounding therapy (getting me out of my head and back to reality) when she does this she brings me toys to throw or her brush or repeatedly nudges me till I do what she wants. That last one is funny for people to watch but not so funny when you are walking on an icy sidewalk… Another thing is pressure point therapy also called Deep Pressure-point therapy or DPT for short. Any way, DPT helps me to relax when I am having a mental moment. the science behind this has to do with putting weight on different points of the body to help decrease heart rate and release tension. Also when she does this, she breathes really loud to make me match her breathing. But the most important things about psychiatric service dogs is that they are trained to never leave their handlers side. She excels at that. 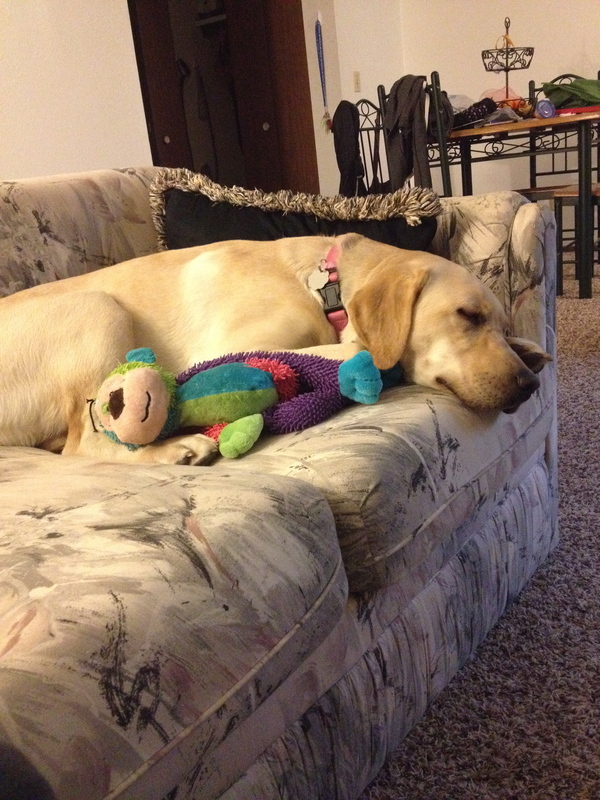 When she is not working (Which she loves to do) she is an ordinary 3-year-old yellow lab. I think that her second favorite person is my fiance Andrew. 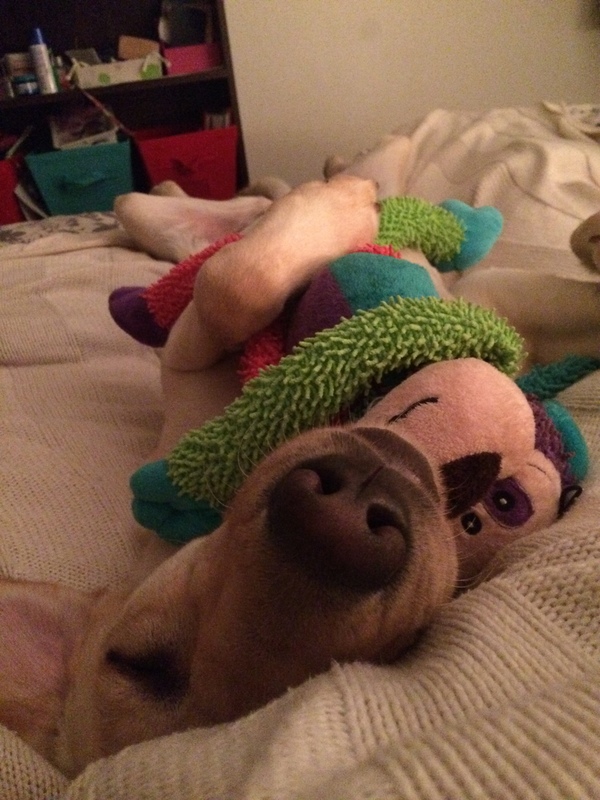 She loves her monkey toys, which she sleeps with all the time and hides everywhere. Her squeaker purple toy is a must for throwing in the house after work, Andrew knows that better than anyone else. Now though, I think her favorite thing is to run around in her very own yard at our new house :). oh And she absolutely loves to cuddle on our comfy furniture. Over all I couldn’t ask for a better super hero to be by my side. Thank you for sharing your story and Bella’s. I have severe GAD, a seizure disorder that can make verbalizing a challenge, and migraines with aphasia. I’ve had the GAD diagnosis for 15 years. I got my first migraine a year before my first period. The seizures – which are not convulsive – were never diagnosed despite years of various evaluations. Hint: remembering an embarrassing event from 20 years ago and fixating for days is not normal, but I thought everyone did that. Enter Cocoa – a pit mix. He was dumped at a church near my house. After nursing him back to health from injuries and a skin condition due to being bait and having him neutered, I took him to a behaviorist for temperament testing. He was mine no matter what, but I needed to know if my nieces and nephews could be around him (never alone with any of my dogs mind you). He passed all aggression tests. If he did something wrong, one correction was all it took. He also had anxiety issues. Helping him learn that the BBQ next door did not mean he would be burned, that storms outside the house were okay because he was inside, and that I’m not going to cook him when I make dinner (I really don’t want to know why that scared him) helped me learn better coping then I had ever had. Fast forward about three years. Cocoa is my office dog by day and teddy bear at night. He stole a pillow and sleeps in the same position I do, the little mimic. He even pets his canine house siblings (well – not the Lab but he’s more like a pony). I underwent a medication adjustment and things started to get weird (still did not have the diagnosis). I could not stand to sit still, I wrote for hours, I had meltdowns, spasms, and rambled (not good for a college professor). My family thought I was doing drugs (yeah, not going there) I thought I was having a psychotic break, but I began to notice that Cocoa was sleeping close to my head. Some nights, he would drape himself over my back. In April 2014, after an 18 hour marathon of Call the Midwife, I spent the day feeling like I was under water. I had not ability to focus. My sister took me to the ER. After several tests to rule out tumor, stroke, and chemicals, a high dose of attivan had me lucid. The most telling piece of information I gave the neurologist was how Cocoa behaved. He sent me for an immediate EEG. Bingo. We have a winner. Cocoa is not trained, but has proven very reliable in detecting moods, migraines, and seizures. He alerted me I was having break throughs months before my routine EEG would have caught them. He does wonders for my anxiety. Because he is not trained, I do not take him out with me as a service animal. Generally, my mom or a friend is with me. Crowds are a challenge for me, especially if I am aphasiac. I teach Composition. I write. Not being able to form the word I want to say and knowing it is so frustrating. I’ve given up phones. I write because those words come. My doctors think a service dog would be good for me and I agree. Dogs keep me calm and focused outside myself. However, Cocoa prefers to be the only dog on this side of the house (Mom has three on the other side). When his time is done, I’ll look into a service dog – hopefully another rescue who needs me as much as I need him or her. I’ve seen people with smaller service dogs get strange looks and doubts from people. I know that its not typical to see someone who “looks” healthy needing a dog. Stories like yours educate people. Like you, my illness is invisible. It doesn’t show on my body unless you look closely (a tremor or spasm here or there). With my dog, I can do many things I could not before. With a trained dog, I know it will be more, but I’m in no hurry. Cocoa can stay forever if he wants, but as his behaviorist said, when it is his time, he will be moving ahead to wait for me and open a spot for another dog to be saved – and to save me. Thank you for sharing your story with me. Keep up a strong fight! 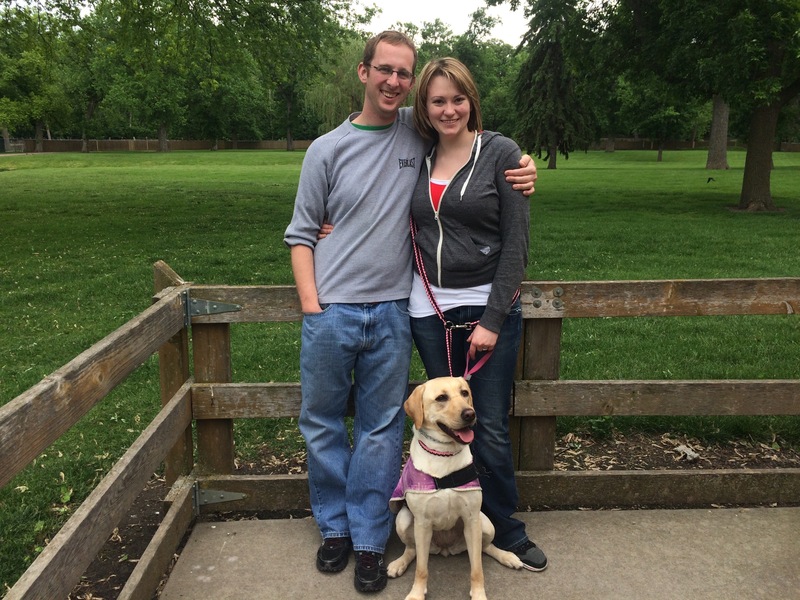 Pingback: Why this picture of a bride and her service dog has gone viral - How to do everything! I’m so happy your wonderful story was shared with everyone. It not only caught my attention with your beautiful photos, but with your story and the common name and that ole Anxiety friend …Such a blessing the dogs in our life can be. My Nellie, a 13 yr old Golden, has been my lifesaver when I didn’t want to keep on…Stress, depression and anxiety have been a huge part of my life. Living with MS since 2008 has had its challenges and Nellie is right there to give let me know life is worth it! As she is now aging, I’m reversing roles. It’s all good, as I do believe dogs are Gods angels!